Oils great for hair, face and body from Schwarzkopf, Pai Skincare and The Body Shop! 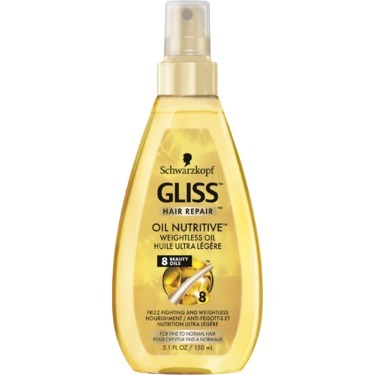 Schwarzkopf Gliss Hair Repair Oil Nutritive Weightless Oil - 150ml - $9.99 - with frizz-fighting and weightless, non-greasy nourishment for fine to normal hair, especially longer hair prone to split ends. The non-greasy formula with 8 beauty oils and keratin not only nourishes the hair, but also deeply repairs stressed hair structure, for fewer split ends. Pai Skincare Rosehip Bioregenerate Oil - 30ml - $40 - contains a highly concentrated blend of organic rosehip fruit and seed oil - rich in omegas to help regenerate skin and beta-carotene - acts as an antioxidant, helping to provide protection against free radicals such as UV light and pollution. With regular use, it deeply conditions skin, improving firmness and elasticity and promoting a clear, even skin tone, as well it can be used to improve: dry patches, flaky patches, blemishes, dull skin tone, fine lines, scars, and sun damage. Available at Murale and select Shoppers Drug Mart BeautyBoutique locations across Canada. The Body Shop Spa Of The World French Lavender Relaxing Massage Oil - 170ml - $20 - with lavender essential oil from the south of France which has a natural relaxing scent which promotes a sense of well-being and soothes body and mind. Available at The Body Shop locations across Canada and online at thebodyshop.ca.